It’s time to remember the 5th of November. Gunpowder, treason and plot! Prepare for Bonfire Night with a lively and engaging first history reader that explains why we light a special bonfire and set off fireworks every November. 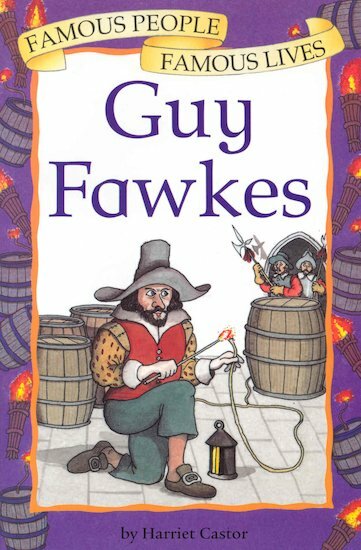 Discover how naughty Guy Fawkes plotted to blow up the King, hiding in the Houses of Parliament to carry out his wicked plan. Gasp at how his plot was uncovered – and shudder at the horrible punishment he endured! Combining clear text with a black-and-white line drawing on each page, this exciting book brings a famous historical event to vivid life. We haven’t approached an author for the series yet, but the proposed author is Harriet Castor. Harriet trained as a ballerina before going to Cambridge University. She worked as an editor at Puffin and Usborne before leaving to become a full-time writer. She has written many ballet stories including a series of books for older children entitled ‘Ballerinas’ (Hodder) and Ballet Magic (Colour Young Puffin). She has also written titles for the Sleepover series.